Chrichton's World: Review Hellboy II: The Golden Army (2008): Visually and emotionally astounding! 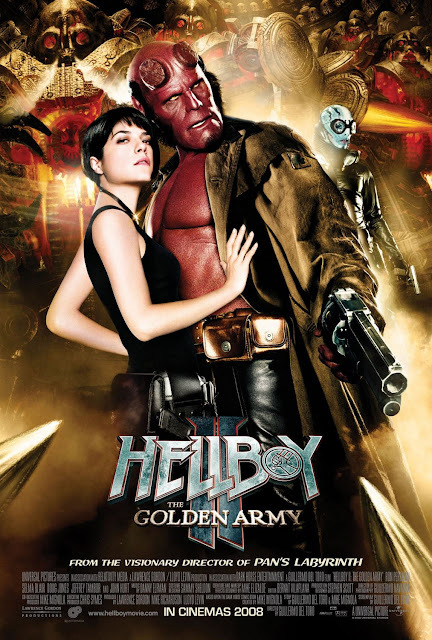 Review Hellboy II: The Golden Army (2008): Visually and emotionally astounding! Sometimes you come across a title and you can't remember a thing about it. Even when you are supposed to have seen it. Usually this is not a good sign. But if I disliked it so much I surely would have remembered. I am happy to report that the flawed perception or lack of is all my brain's doing. Or not doing, what it should have done in the first place. In my defense I have watched so many movies that you can't expect me to remember all of them. So what did I think of Hellboy II: The Golden Army? To be honest I was completely surprised how much I liked it. A lot of what this film was offering clicked with me. The very comedic and lighter approach to most events worked well with some of the more darker and serious moments. But it never went so far that the darkness would turn you off. I think a lot of movies these days go too dark because they find that it's edgy and therefore better. I don't agree with that at all. A good filmmaker should strike a balance unless the source material truly is only dark. I haven't read the Hellboy comic books so I can't say anything sensible about that. But from what I gathered on the almighty internet is that the Hellboycomic books are funny. Guillermo del Toro clearly knows his stuff and he has done his best to bring the comic book world to life. As far as I can tell without any knowledge of the comic books I think he has succeeded. I was fully embracing the fantastic and how creatures like Hellboy and Abe Sapien could wander about in it like they belong. Even if you like me forgot who they were and what they were about you would get back into swing within the first scenes of the film when they appear. Best of all is that right from that point you are going to like them just because of the comedic antics that occur in those introductory scenes. What you do have to understand is that this isn't your typical good versus evil type of film. While you do have good fighting evil there are moments where you are made to question the distinction. Prince Nuada (Luke Goss) is not your average villain. He does questionable things but he is motivated by a sense of honour and wanting to protect his clan of Bethmoora elves. Another theme that is being discussed is a universal one. What or who is most important to you? Do you let yourself be defined by what you do and have done? Or are the persons you surround yourself with who matter the most? Hellboy is confronted with this life question when asked by his girlfriend Liz Sherman (Selma Blair). This might not sound that epic or enthralling but to me it was something I could relate to wholeheartedly and therefore was something I could immerse myself fully. Don't get me wrong I want my spectacle and beautiful eye candy on top of these moral questions but it's nice to have it as an extra thing to ponder on. Hellboy II: The Golden Army offers immensely beautiful eye candy and spectacle. It has more than enough action but might not always feel as epic as it could have or should have been. The Golden Army sequence was immensely exciting and cool but was far too short for my taste. They easily could have prolonged it and then I think even the biggest haters would have been more accepting. Then again these are the kinds of movies that speak to a certain audience. They are hardly appealing to everyman. As for me I really dug the film and I can see myself watching this from time and time again. If you haven't seen this one yet then I can surely recommend this to you!